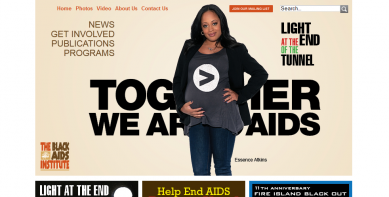 Founded in May of 1999, the Black AIDS Institute is the only national HIV/AIDS think tank focused exclusively on Black people. The Institute’s Mission is to stop the AIDS pandemic in Black communities by engaging and mobilizing Black institutions and individuals in efforts to confront HIV. 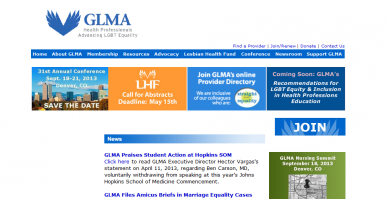 Through the expertise of our members and in collaboration with other lesbian, gay, bisexual and transgender (LGBT) civil rights and health organizations as well as with health associations and policy-makers at all levels, GLMA is a major force in the effort to ensure the health and well-being of LGBT individuals and families. Founded in 1980, HRC advocates on behalf of LGBT Americans, mobilizes grassroots actions in diverse communities, invests strategically to elect fair-minded individuals to office and educates the public about LGBT issues. 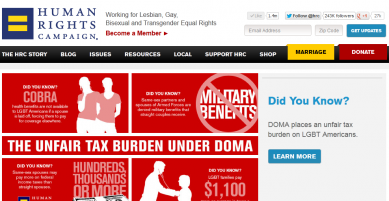 As the largest civil rights organization working to achieve equality for lesbian, gay, bisexual and transgender Americans, the Human Rights Campaign represents a force of more than 1.5 million members and supporters nationwide. HRC advocates on behalf of LGBT Americans, mobilizes grassroots actions in diverse communities, invests strategically to elect fair-minded individuals to office and educates the public about LGBT issues. 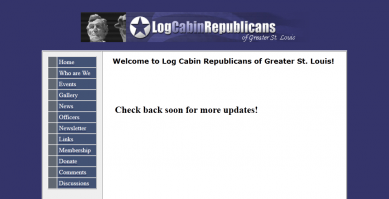 The mission of the Log Cabin Republicans is to work within the Republican Party for the equal rights of all Americans, including gay men and women. We are loyal Republicans. Polls show one-third of gay and lesbian voters support fair-minded Republican candidates. We represent an important part of the American family speaking up as a powerful conservative voice for fairness. 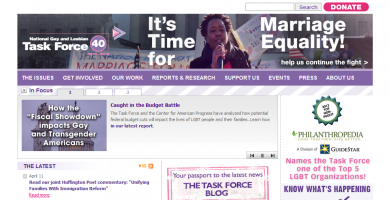 The National Center for Transgender Equality (NCTE) is a social justice organization dedicated to advancing the equality of transgender people through advocacy, collaboration and empowerment. 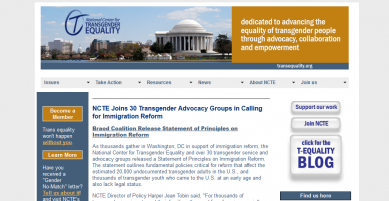 NCTE provides this presence by monitoring federal activity and communicating this activity to our members around the country, providing congressional education, and establishing a center of expertise on transgender issues. 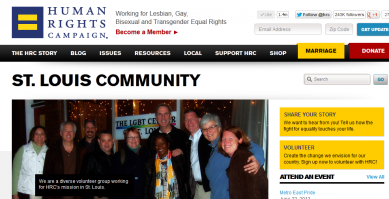 We bolster the strength of local LGBT activism in rural enclaves, small towns and cities nationwide. We build grassroots political muscle at every level by training activists, strengthening the infrastructure of local and state allies and organizing broad-based campaigns creating public support for full equality of LGBT people. We identify LGBT rights supporters, educate them on the issues, give them the tools and the confidence to participate in the political process, and get results. 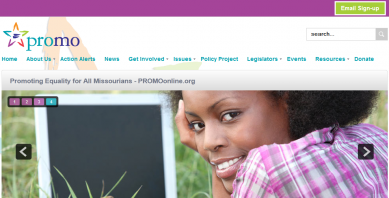 PROMO’s goals are to help LGBT Missourians create a supportive and visible community, become active in the democratic process, and work for their equal protection under the law. We build community awareness and grassroots support for LGBT equality and increase civic participation of LGBT Missourians. 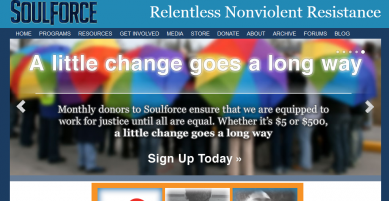 Soulforce is committed to relentless nonviolent resistance to bring freedom to lesbian, gay, bisexual transgender, and queer people from religious & political oppression.